I have a problem with Chrome (2.0.172.33) and the current version of FCKeditor (2.6.4.1). As you can see, the height is nowhere near 400px (outer border). But as soon as I click inside the content window, the height adjusts it self automaticly to the proper height. Any one else who's experiencing this? Or has a solution to this? I've tested it on IE 6, IE 7 and Firefox 3.5 - It all works as expected. It seems limited to Chrome and Safari (as you point out). Somehow the rendering at page load is faulty. Maybe it's a browser-file setting? Since the .NET engine renders the page (HTML) differently depending on the capabilities of the browser. I'm experiencing the same problem. When using a set height of 300px, firefox will calculate the specific iframe (selector: #xEditingArea iframe) to height 265px. However, Google Chrome just sets this same iframe to 100% height. 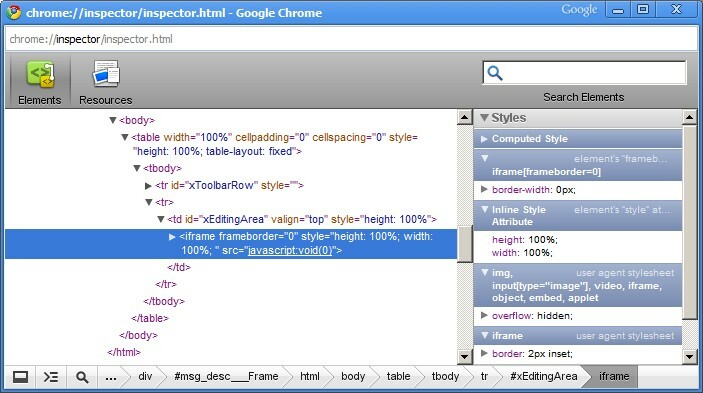 An iframe cannot have 100% height in any browser, it will use it's default height instead. This is exactly what's causing the problem! This faulty '100%' height is set in /fckeditor/editor/_source/classes/fckeditingarea.js @ line 99. I can't locate where Firefox and IE are getting their correct computed values from, but I expect the problem should be solved there. Hopefully that will solve it. Doesn't make any difference; only brings up other problems. The 100%-height still remains, even though other browsers have a nice computed height in pixels. See one of my previous posts for more details. Although this works for me, I noticed it is doing it on eBay. The iframe is not the correct height. I reported this as a bug in Chrome. Note: this is not a fix! So the problem still needs further investigation!!! Besided this would be a work-around and not the solution, FCK is configured that way already by default. So it doesn't work. The problem lies in the height of that specific iframe being configured as 100%, instead of a fixed height in pixels. An iframe with 100% height will only be 100% when the browser is set to run in quirks mode. Since most of use use a more recent doctype - like xhtml strict -, this is a problem that needs to be fixed within FCK itself! Which page does this go on? Just as many, I also experience this issue. I too believe this has something to do with the height set on the iframe. My findings however indicate this is not just the height=100% on the iframe, but also the height of the table holding the EditingArea specified in fckeditor.html. I believe the difference of 29 pixels between the height I set and what I need to setup in 2 and 3 accounts for the height of the toolbar (set to basic). [#3053] Fixed problems with the height of the content area in Safari and Chrome. Now the height is to long instead. As you can see, the height is too much and the bottom scroll down button is not visible. This little jQuery code does the trick, drawbacks: must have on each page that has a FCKeditor, and the timeout would be nice to avoid. I don't know if this fix applies to CKEditor as well but hopefully this will help some of you. I don't know if this is the best way to fix this problem or if this is considered a hack, but at least for now, it solved the issue on our site. Thanks. It does the trick for me as well. It's not a hack since it's working .